Do you ever get the feeling your competitors are moving faster than you? Somehow they’re always one step ahead on their digital marketing campaigns and business development efforts. In the digital era, it’s not only natural to look around at what your competitors are doing, it’s necessary! Unfortunately, this often leads to a panic attack and wasted energy worrying catching up your competitors. Luckily, there’s a great software we know about that handles all of your competitor analysis automatically, however before you can catch your competition, you need to find out who your competitors are. 1. Starting Point: Who Are My Actual Competitors? Before you go insane listing out your 50 closest competitors, take a moment to define what you are really competing for and ignore the rest (for now). Run a few Google searches for your top keywords and see who appears. 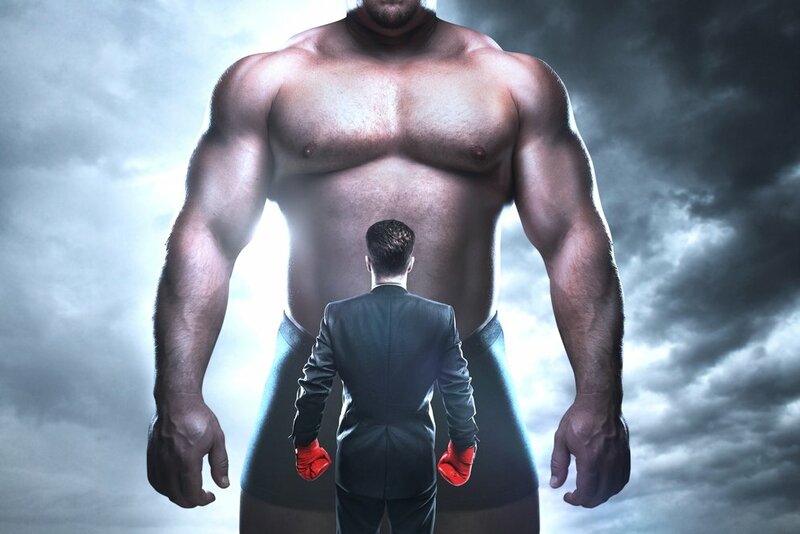 Are they your direct competitors or indirect competitors? Often times, companies get so wrapped up with their direct competition, they forget to track their “alternative competitors”. These are the products or services that your customers could select to use as an alternative to your entire industry’s offerings. These alternative indirect competitors are often stealing more marketshare than you previously thought and need to be considered when tracking your competition. Who is the well entertained rival that’s been doing this the longest and has an established customer base? Who is the young, well-funded startup stealing more marketshare everyday? Finally, who is always pushing the boundaries of your industry? Testing new ideas? The most outspoken on their blog and social media? Now that you have a list of 5 or so competitors, you’re able to dig a bit deeper and look at their strengths and weaknesses. 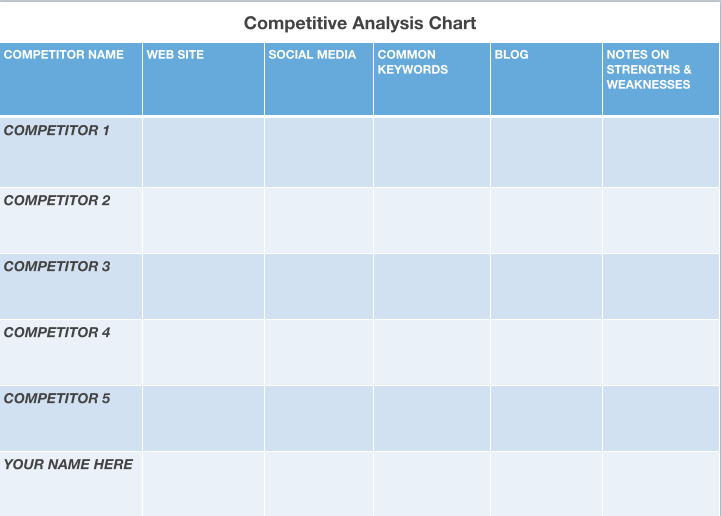 Make a SWOT analysis chart that has your competitors names in the left-hand column and title the rest of the columns with website, blog, social media and offline sales. Give each company a ranking from 1-10 on how well they’re performing in each category. Don’t forget to include you’re own company. Once the chart is complete, you’ll begin to see some holes in each competitors’ strategy. What are they doing really well? Where are they failing? This is where you’ll start identifying clear way to make an impact. Once you identify the weak points in your competitors shield, you now have to decide whether or not to exploit them. For example, if your competitors have a massive sales team that is pounding the pavement, see if you can beat them with your online marketing efforts. Perhaps their blog or social media hasn’t been updated in a while. That’s a sign that they’re neglecting their online channels. You need to find out why. Try to identify 1 or 2 key areas of their strategy where your company could really improve and overtake them in the market. Bring in your team and make sure everyone is aligned on your strategy. By working together you’ll expedite your progress and have a support team to generate new ideas. It’s critical that everyone understands the importance of these efforts and collaborates effectively. If you’re going to building a social media or content marketing workflow, implement the tools necessary to keep everyone on the same page. Assign roles for editor, creator and publisher and be sure to share one single editorial calendar to display your content and who’s responsible for it at each stage in the process. Set high, but achievable goals for your team based on recordable metrics. If you’ve decided to publish more content, assign a quantifiable number that each department or individual is responsible for creating. Next to that number, place your desired outcome. For example, we are going to increase our blog published to 3 posts per week and we expect to see a 20% increase in online traffic within 90 days. The final step of any new strategic implementation is to look back and see if you are making progress. After 90 days, review your goals and measure your results. Are they making the desired impact? These periodic checkpoints allow you to see your results overtime and make adjustments along the way. Revisit your original SWOT analysis and see if you agree with your first assessment. Have someone else on your team repeat the exercise and compare your rankings. This may lead to a new revelation or pivot your focus to a new opportunity that didn’t appear before. This internal competitive analysis should be a regular practice conducted within your company. It helps put your company in perspective within the context of your customer’s mind. As the list of your competitors grows and your team gets busier, adopt a software tool that handles the competitor tracking automatically and sends you alerts to the most important updates from your competitors. This will save you time, money and from pulling your hair out trying to keep track of your competitors movements.